Lower rates available for under 6 people. 2 night stays and public holidays charged higher than listed rate. For these type of bookings please make a " booking enquiry " instead of a "booking request" so that an accurate quote can be given. Beautiful Ngakuta Bay is set in the prime area of Queen Charlotte Sound. 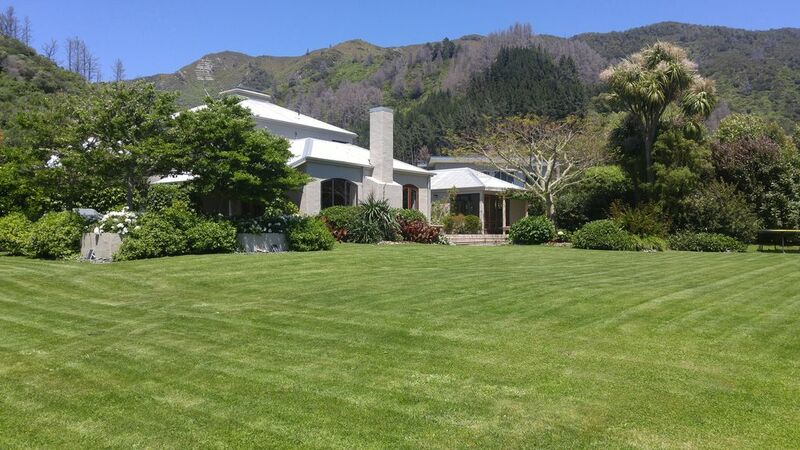 It is a 15 minute drive to Picton or to the start of The Queen Charlotte track and 30 minutes to Marlborough's wineries. Our picturesque bay has a large grass reserve to lovely safe swimming beach,a good boat ramp, a new jetty and ski lane. The bay has an excellent mountain biking /walking track that has spectacular views of Queen Charlotte sound and in our opinion views equal to anything seen on the Queen Charlotte track. This area is a kayaking /boating paradise and has won NZ tourism wards and international recognition for its scenic beauty for both summer and winter. Our large architectural designed holiday home is situated in main Ngakuta Bay where the sandy beaches and boat ramp are [not in Little Ngakuta Bay]. It is a sunny resort style property for both summer and winter and is only a 2 min walk to the safe sandy swimming beach.The home is set in 1/2 an acre of private,lovely landscaped grounds with spacious flat lawns and is fully fenced. The three living areas all open out to attractive decks [at ground level] and a lush courtyard BBQ area for dining. * If you wish to bring a dog please arrange this with me. * Sky digital 40+ MULTI room [2 wide screen TVs] including sky sports 1,2,and3 no need to fight over the choice of channels with the children. * The games room has a table tennis table and some childrens books and toys. * We have 2 kayaks with childrens and adults life jackets available for your use. * A 14ft round trampoline provides extra fun for the kids. * Plenty of off-street parking. * 2 large fridge freezers for plenty of food and beverage storage. * We have linen available for hire for $20 per person per stay. * 4th bedroom can be made up as a 3rd double bed if required or left as 2 singles and 1 single bunk set. Our lay out is flexible ,we are happy to split kingbed if singles are needed or to put 2 singles together to create a King bed. Extras: Compulsory Cleaning charge $100 to be paid directly to the cleaner via an envelope at the house. Linen is available to hire $20.00 per person includes sheets, pillowslips,bath towels bath mats and hand towels. plenty of cooking and serving dishes for large groups. Fully equipped kitchen with plenty of cooking and serving dishes for large groups and a 2nd large fridge freezer in the laundry close to kitchen for plenty of cool storage. Lovely views to garden, table seats 8 with room for a small additional table if needed, TV in this room if you need to keep up with the sport or news! Loved it despite the weather. Well equipped, spacious and so privileged to be able to take our dog. Would love to return. Only thing missing was a teapot! Loved having you . You are most welcome to return. Thank you for the feed back.We have now provided several tea pots in various sizes for those who wish to brew a real cuppa! Spacious, well-appointed retreat with delightful art on the walls. Had everything we could need! We only wish we had spent more time there to enjoy the garden and the surrounds. Would love to visit again. Location was fabulous.. easy access to beach, Picton and wine district not far away, trails in backyard plus artwork unique and incredible!! Tastefully decorated home!! Would highly recommend to those visiting the area. Lovely House and Garden, great indoor and outdoor spaces, only problem is the stove can be tricky to understand, plenty of cooking gear, a short walk to the beach, sheltered by the garden trees from the afternoon breeze. Just lovely. We loved our time here. The house suited us perfectly (5 adults and 6 kids aged between 3-12) The location was awesome - a short walk to the beach, and an even shorter ride to the beginning of some amazing mountain bike/walking tracks. We enjoyed kayaking and paddle boarding too. Only a 3km walk to Momorangi for an ice cream. Plenty of beds to choose from and the most beautiful garden to enjoy. A lovely outside entertaining area that felt very private. We plan to be back!